Layla Tattersfield in action during a game this season. Tattersfield had one shot in the Bulldogs’ 21-3 loss to Georgetown on March 30. Jimmy Lafakis/Collegian file photo. The Butler lacrosse team lost to Georgetown in its first Big East game of the year on March 30. The Bulldogs were on the short end of a 21-3 margin in the home contest. A common theme in losses this year, the Bulldogs went down early. Georgetown scored the first six goals of the game. It wasn’t until more than 15 minutes had passed in the game that Madeline Hooks got Butler on the board for the first time. Georgetown only extended their lead by two before the Bulldogs struck again. Less than seven minutes later, Kailee Callaghan scored Butler’s second goal. 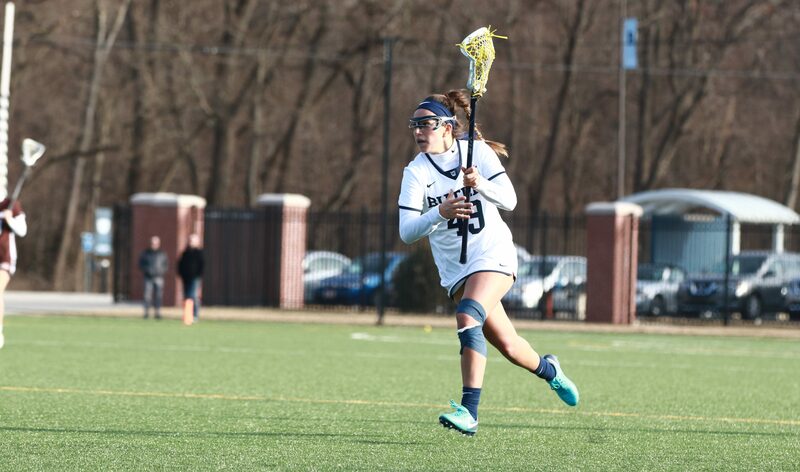 An 8-2 score represented some hope, but it was dashed after nine straight Georgetown goals. Facing a 17-2 deficit, Hannah Justice scored Butler’s third and final goal about halfway through the second half. Georgetown scored the last four goals of the contest. The loss drops Butler to 3-8 on the season and 0-1 in Big East play. The Bulldogs are back in action on April 2 as they travel to Cincinnati.